There are ways to allow your institution to experiment with online courses, even if they're not intended to be "massive." An online program manager shares advice. For Fomin, the answer lay with an alternative MOOC platform, Canvas Network, which is run by the same company, Instructure, that produces her campus' chosen learning management system, Canvas. 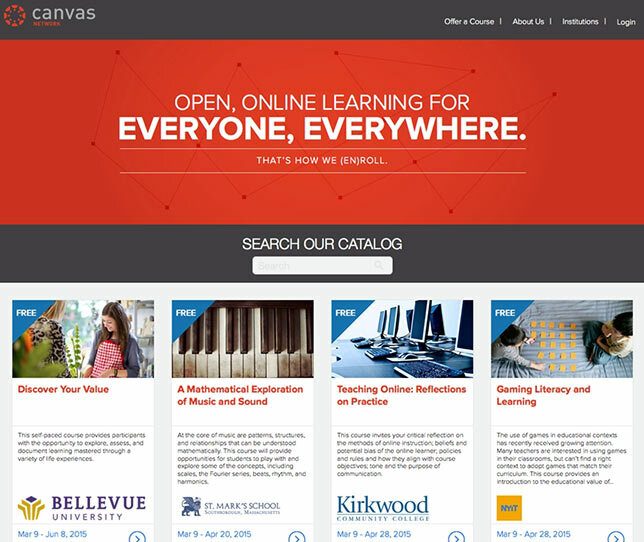 Canvas Network will host courses from two-year and four-year colleges, K-12 schools and districts, academic partnerships and consortia, non-profits with an education or public mission, government agencies with an education mission and even for-profit companies if they're teaming up with an educational organization. The site currently hosts about 70 courses, all for free, as a way to demonstrate its commercial LMS. As Fomin described the Canvas Network MOOC offerings, "They don't tend to mirror what you'd see in a traditional state university MOOC. They're shorter. They don't have as much interaction with the faculty. They're more like e-learning — a little bit smaller [and] easier to digest." If you're producing a "massive" online course, a cadre of people will line up to do the heavy lifting (and possibly take some of the credit). Not so with a smaller version. At Dearborn, it took creative navigating inside Fomin's university system from one department and administrator to another for five months before she was able to get approval on that two-page agreement. This was an untested idea, and there was apprehension about the project. Fomin discovered that she had to adjust her narrative about the course goals as she searched for a champion. Final approval came from a leader in the Communications and Marketing division at the Dearborn campus who considered the course she was proposing "more of a marketing activity than an academic one" — of value in a highly competitive education market. "He took the time to go through my proposal and said, 'Yes, I see no harm in this.'" Alternate MOOC sites probably provide a template format into which your course can be poured. Many of the platforms are run by LMS companies, and they simply follow the same kind of process you'd go through when you set up a course inside the software. As Fomin put it, that part of the work "wasn't terrifying." Canvas Network provided a course shell with default elements and offered free instructional design help by phone. The contents didn't include much video; screencasts are more prevalent at the campus, and that's what Fomin stayed with for the course. In fact, much of the content already existed at her campus; because it was built using the Common Cartridge standard, it could simply be extracted and repurposed for the new course. Although your course probably won't draw the tens of thousands of registrants that the better publicized MOOCs do, you still need to be prepared for a crowd. Fomin advised considering class size when determining what pedagogy to use. For example, since this type of online course probably won't have the level of faculty support that a traditional MOOC gets, consider how grading of assignments will be done. In Fomin's case, even though she's never had more than 30 students in any of her online classes, she's relying on auto-grading tools built into Canvas to make the process more efficient. An advantage of going the less traveled route in choosing a MOOC provider is that it may not limit teaching to faculty, as the larger services do. As Fomin noted, "If your instructional design team or library staff wants to do something, they can." As it turned out, that's exactly what she wanted. Contributions came from faculty and staff within the library, instructional design and Web design departments. Fomin's idea for the MOOC was to set up a five-week course that would cover technologies of use to Dearborn's students (and anybody else who had an interest) as part of their education in digital literacy. The idea was that faculty could promote the course to help their students grasp how to use new tools on campus. The sessions covered such topics as Google Drive and Box (both in use on campus), file formats, file management and permissions and open source software. Fomin anticipated that her first MOOC would be added to Canvas Network online catalog sometime later this summer. Once it's listed, her group will promote it through in-house journals that are used to communicate across the University of Michigan campuses, on Facebook and other forums. The goal is basic: to try out a MOOC and see what happens. "What we're doing is encouraging people on our campus to think of these [instructional] modes in a different way and to allow faculty to experiment." The experimentation may be done at a smaller scale than other institutions, but the results could have far-reaching impact.